I've been comissioned to do six 1-page, full-color comics for DRIVEN MAGAZINE. The magazine comes out bi-monthly as an insert in Canada's Globe and Mail newspaper. The strips, called Bio-Graphical will be found on the last page of each of the next six issues. My editor is the great Gary Butler, who also writes the "Blood in Four Colors" column for Rue Morgue Magazine. 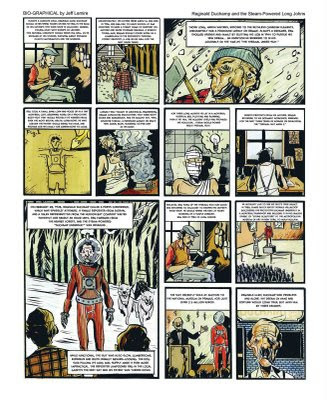 Here is the first strip which came out in the September issue, the the next is due out in October.